iPod accessories are pretty common these days, so it’s hard to stick out among the throng—especially when you’re talking about the throngs that flock to Macworld Expo. Nekfit offers an alternative to many similar iPod nano accessories targeted at the athletic set. 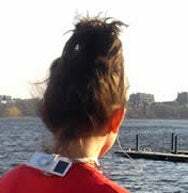 Instead of creating a device that attaches your nano to your arm, the Nekfit attaches it to your neck. Sound uncomfortable? I tried it out, and it actually feels weightless. The people at Nekfit arranged for runners of the Boston Marathon to wear their accessory during the race; they also sought feedback from college sports teams. The athletes were surprised at the range of activity they could perform compared to other iPod nano accessories. By keeping the arms unencumbered, the athletes could remain active in their respective sport and still listen to music. Recently, Nekfit has unveiled an improved design that encases the nano in a hard plastic shell—adding protection to the device’s convenience. While definitely a niche product, Nekfit was one of the most practical gadgets I saw at Expo.